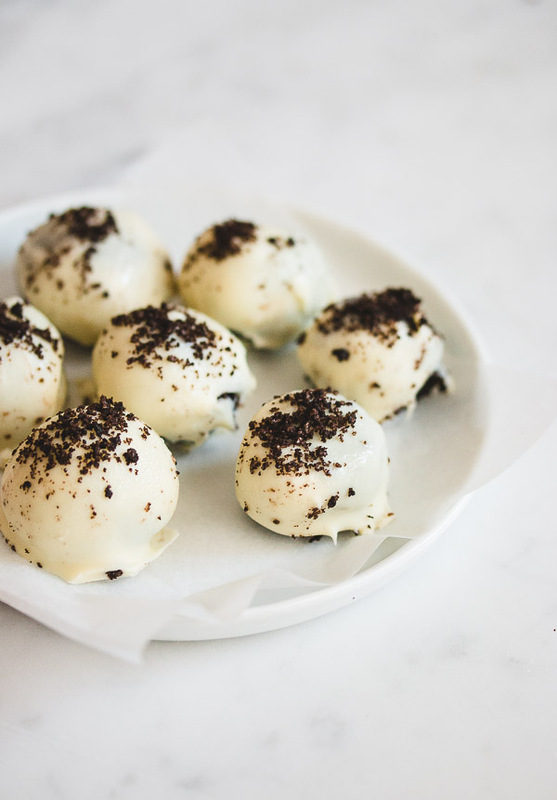 3-Ingredient Addictive Oreo Truffles - Pretty. Simple. Sweet. 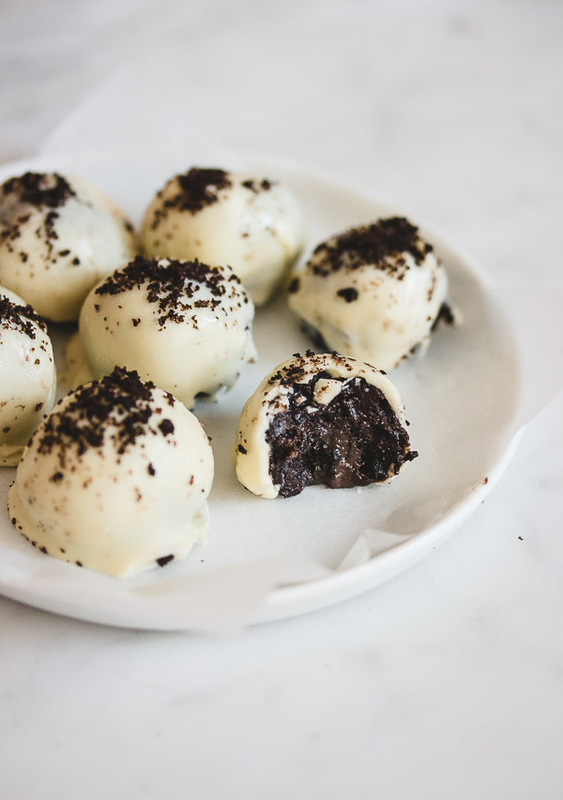 Addictive fudgy oreo truffles that are coated with white chocolate and made with only 3 ingredients. You won’t be able to get enough of them! Here’s what I like best about Oreo cookies: there’s not much you need to add to them to make an incredible recipe. This, of course, is why I keep about 5 packages of that deliciousness in my pantry at all times. 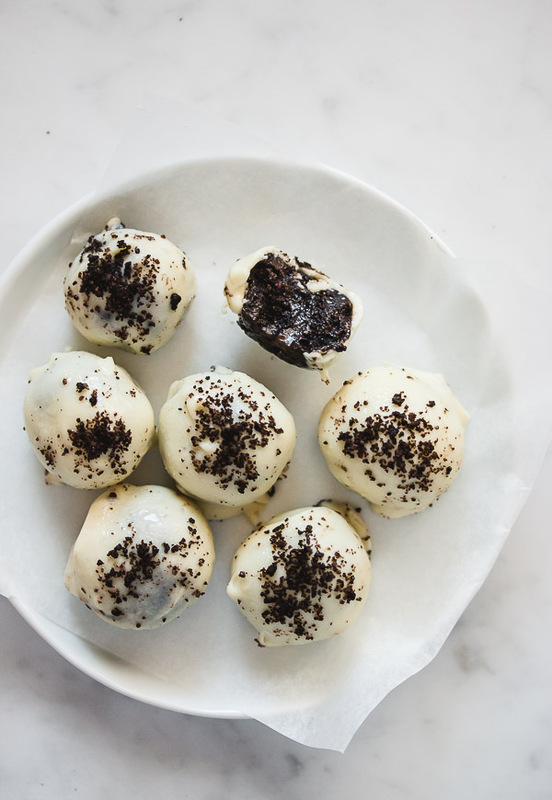 To make these moist and fudgy Oreo truffles all you need to do is process the cookies and mix the crumbs with cream cheese, then coat them in white chocolate. 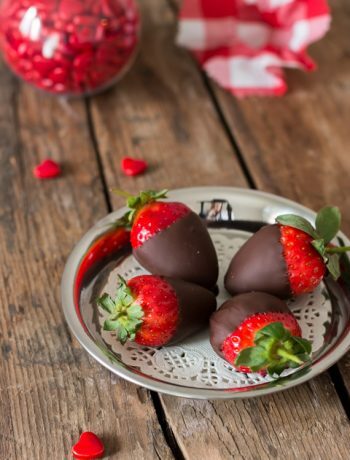 Dark chocolate is a good alternative, too, if that’s what your heart is pulling you toward. When you melt chocolate, the crystals of the cocoa butter lose their shape and are not able to resume it when the chocolate hardens. This results in chocolate that may look dull and have white streaks and spots on it. 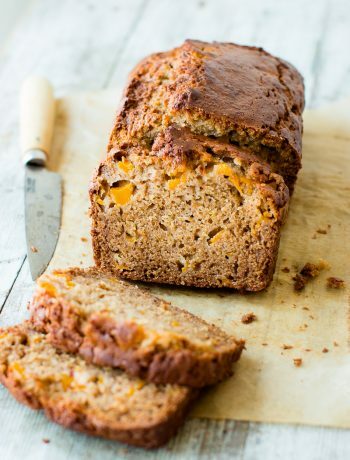 It’s perfectly fine to eat, it just looks unappealing. To avoid this, we either need to temper the chocolate—a process not everyone is familiar with—or refrigerate the truffles. The coolness of the refrigerator will stratify the cocoa fat and the chocolate will look perfectly fine. The only drawback is that if they’re left out for too long at room temperature, they will start to sweat. But what kind of person can resist these long enough for them to reach room temperature? Chocolate chips or candy melts, on the other hand, don’t need to be tempered since they are made mostly of hydrogenated fat and therefore act differently than “real chocolate”. They will harden and look fine when left at room temperature, although the flavor won’t be quite as good as genuine chocolate. 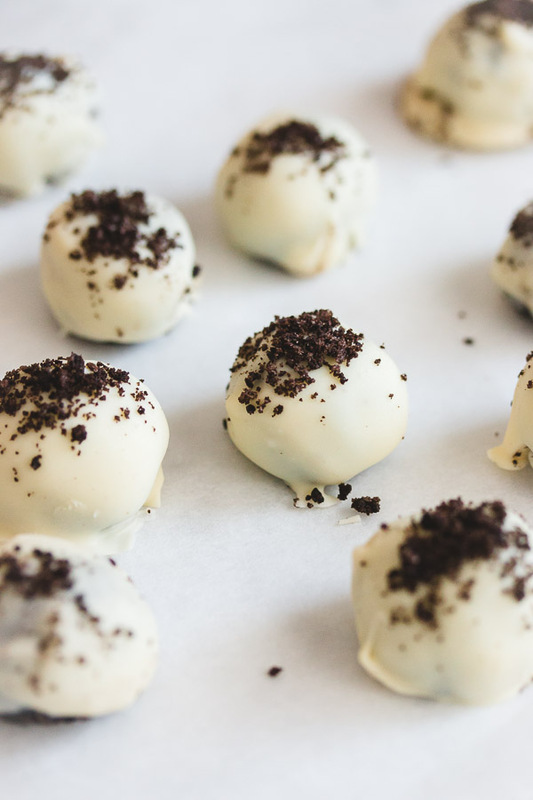 Now enough with the chemistry lesson, it’s time to make some super easy and addictive truffles! Process Oreo cookies in a food processor until finely ground. If you don’t have a food processor, place cookies in a plastic bag and crush finely using a rolling pin. Reserve 2 tablespoons of cookie crumbs for garnishing. In a medium bowl, mix cream cheese and cookie crumbs until well combined. Refrigerate mixture for about an hour, then shape into 1-inch/2.5-cm balls and place on a baking sheet lined with parchment paper. Freeze until firm, about one hour (freezing will make the balls firm and easier to dip into the chocolate). Using two forks, dip and coat balls with melted white chocolate and place on parchment paper. Sprinkle with reserved cookie crumbs. Place in the fridge for 10 minutes, until chocolate hardens. Keep in the refrigerator and serve chilled, so the chocolate won’t melt. Truffles will keep for up to 4 days in an airtight container. Yep, totally drooling over here. These look so stinking good, so stinky easy, and kinda like I might need an entire dozen to myself, ASAP. I’ve gotta make these soon! Thank you for your comment Emily! I want to make these for a teacher cookie exchange but refrigeration after school delivery may not be possible. Adaptable ? Or should I find another recipe? Thanks! 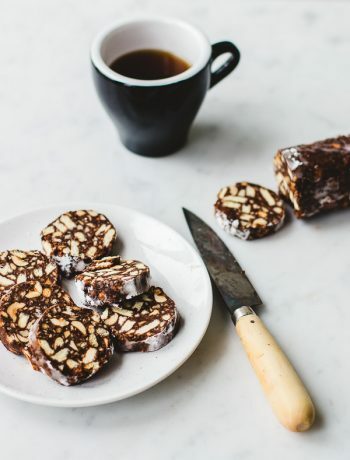 It’s possible to leave it at room temperature for a while or to transfer it to its destination, but it should be served rather cold, otherwise, the chocolate will start to “sweat”. I have other amazing cookie recipes or snack recipes if you’re looking for some inspiration! Do you take the filling out of the Oreos first? No because they add great flavor and texture. איזו גבינה להשתמש במילוי ? Hi Ofir, you can use any cream cheese that contains about 30% fat. Love this! Made it for the animal organization I volunteer at! melting white chocolate. can be tricky. I need directions. I melt my white chocolate either over low heat in a small pot over the stove, or in 30 second increments in the microwave in small amounts.